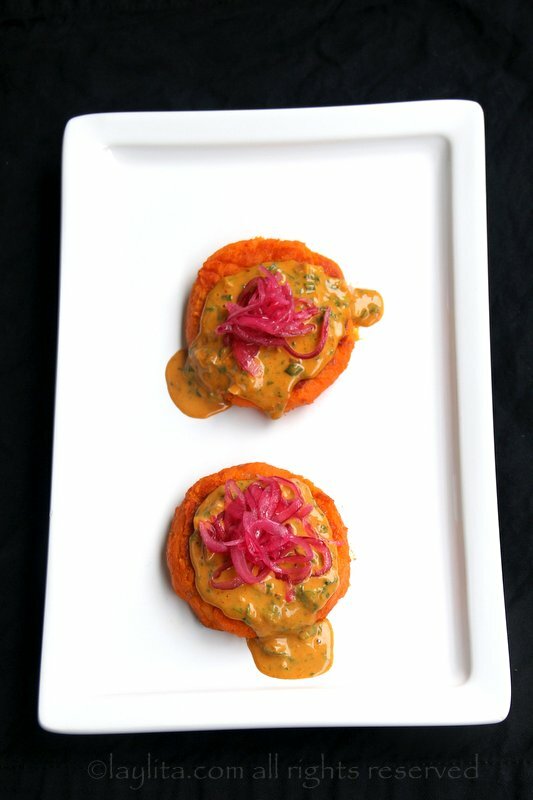 This recipe for sweet potato patties stuffed with cheese is a variation of the popular Ecuadorian potato llapingachos. 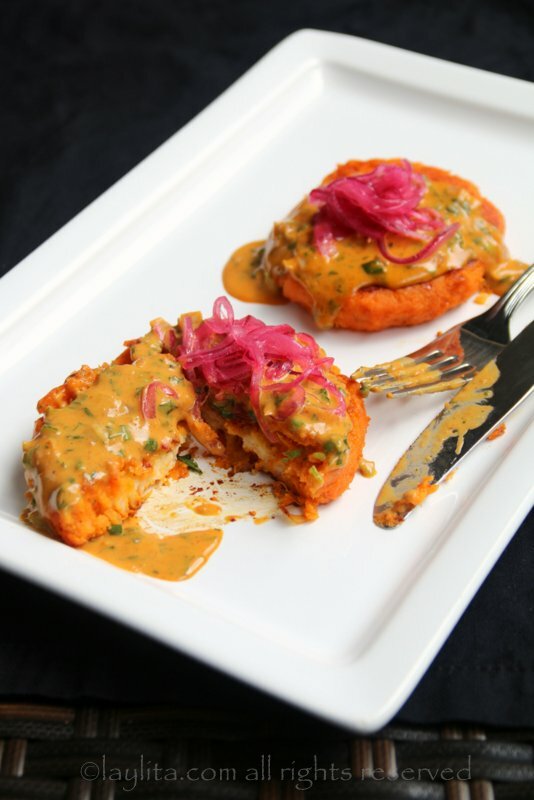 Llapingachos are usually made with regular potatoes and are cooked on a griddle until crispy brown on each side. 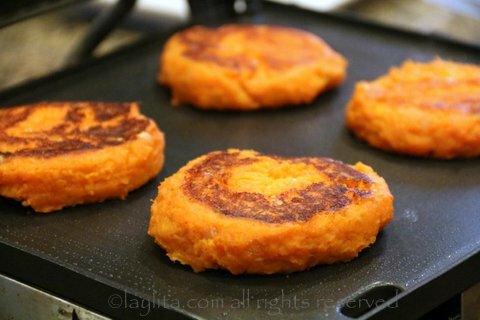 The sweet potato patties are great to serve for breakfast or brunch. You can also serve them with additional side dishes to make a full lunch meal, or make them bite size to serve as appetizers. 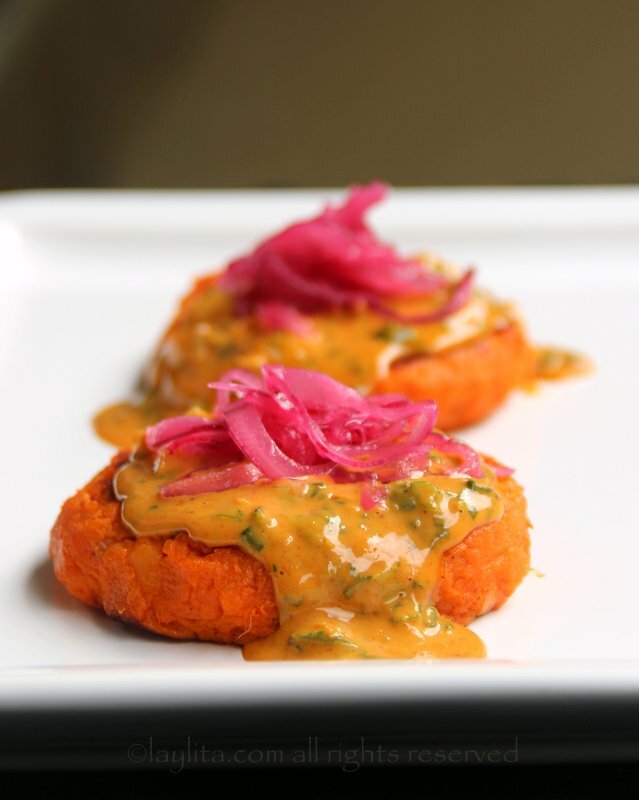 The sweet potatoes are boiled and mashed, then mixed with a refrito or sofrito of onions and achiote/annatto. 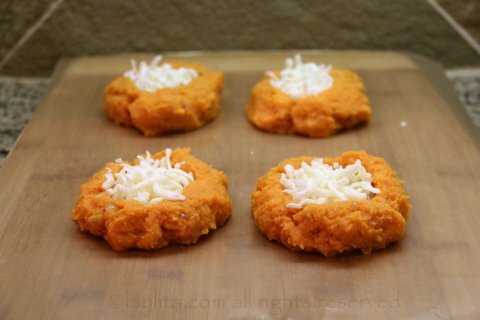 The mashed sweet potatoes are then stuffed with cheese – you can use your choice of quesillo, queso fresco, mozzarella, or any cheese that you like -, and formed into patties. Cooking the patties on the griddle is a little bit tricky since they are very delicate and fragile. My recommendation is to make sure the griddle is very hot and try to only turn them once, they are less likely to crumble if they get a nice sear. They take about 5-7 minutes on each side, but this might vary based on the griddle you are using. After the first one, you’ll probably have a better idea of how much time they need on each side. If you don’t have a griddle, you can also use a frying pan, it’s just a little harder to flip them over. 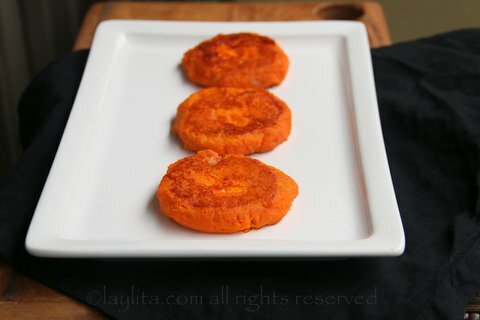 Recipe for sweet potato patties stuffed with cheese, or llapingachos de camote, made with mashed sweet potatoes, onion and achiote refrito, and cheese. 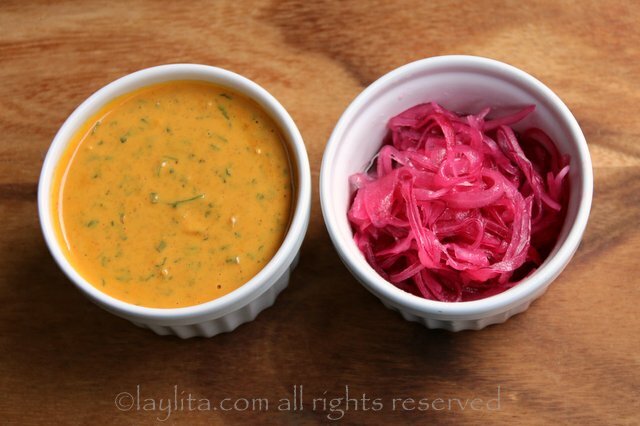 Serve topped with peanut sauce and pickled red onions. 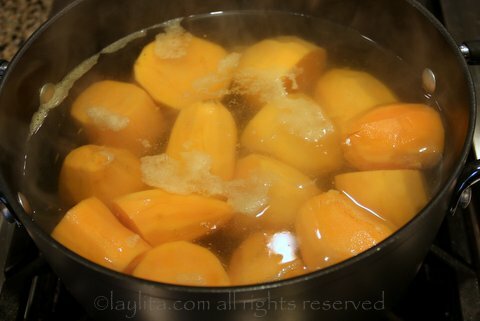 Boil the sweet potatoes until soft, about 20 minutes. 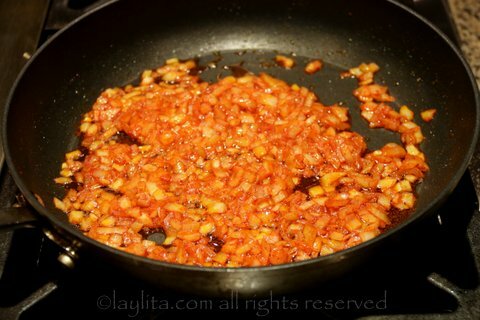 Heat the oil or butter over medium heat in a frying pan, add the onions and achiote, cook until the onions are soft, about 5 minutes. 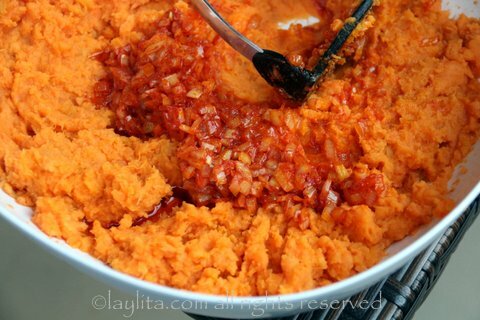 Mash the sweet potatoes with the onion achiote mix, add salt to taste. 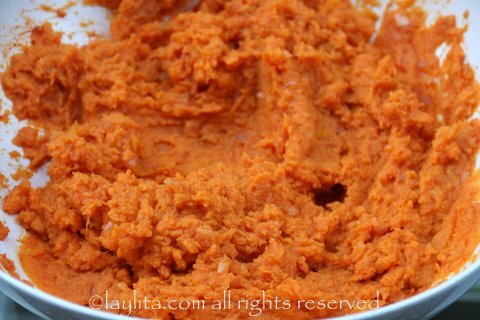 Cover the mashed sweet potatoes and let it sit at room temperature for about an hour. 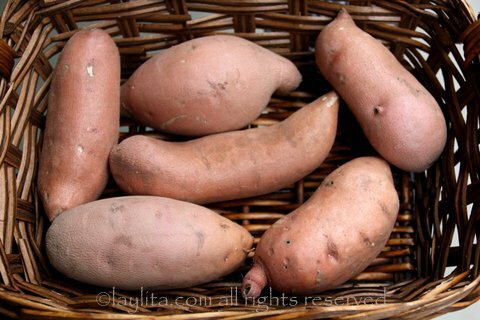 Make small golf size balls with the sweet potato mash. 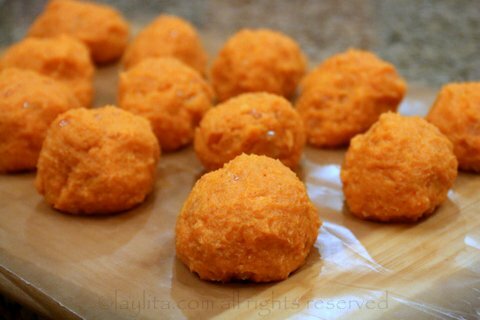 Make a hole in the middle of each ball and fill it with the grated or crumbled cheese. 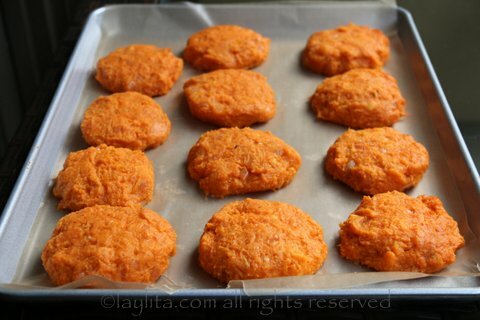 Gently shape the dough into thick patties and let rest in the refrigerator for about ½ to 1 hour (if you have the time). Cook the patties on a hot griddle until browned on each side, about 5-7 minutes per side – adjust based on the temperature of your griddle. Turn them gently as they are very delicate. 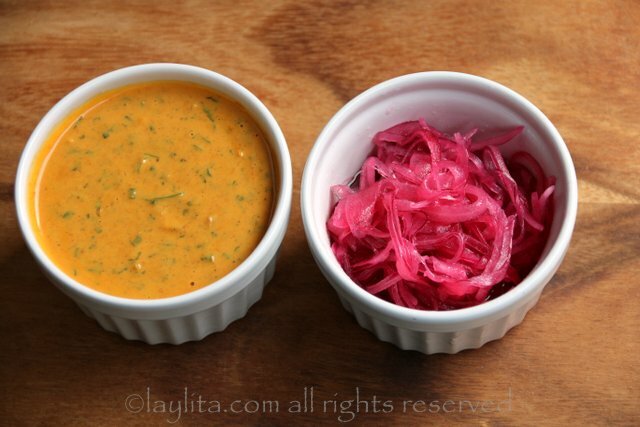 Serve with salsa de mani or peanut sauce, lime pickled red onions, avocado slices and hot sauce. 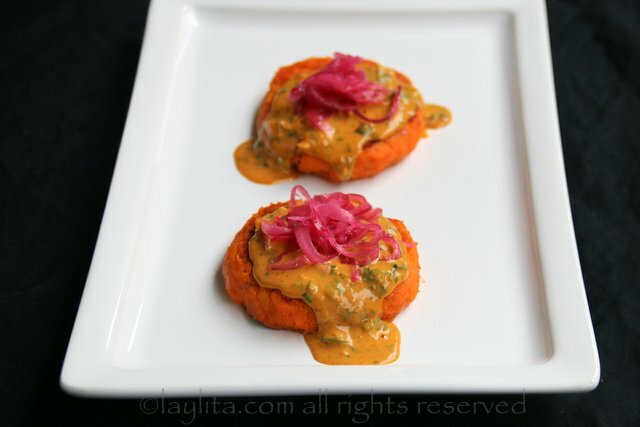 These llapingachos de camote or sweet potato patties are served with an Ecuadorian savory peanut sauce or salsa de mani. 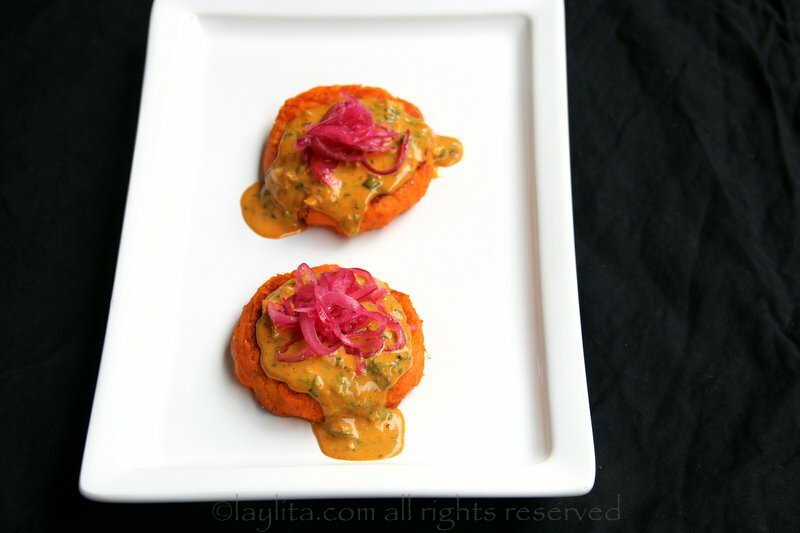 I also served them with some cebollas encurtidas or lime pickled red onions on top – the tanginess of the onions combines perfectly with the creaminess of the peanut sauce and the sweetness of the sweet potato. 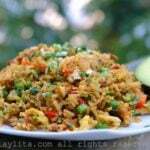 You can also add some avocado slices or diced avocado on top. If you want to make this a complete meal, serve it with some lettuce leaves, tomato slices, fried eggs or eggs cooked on the griddle, and some chorizo sausages. 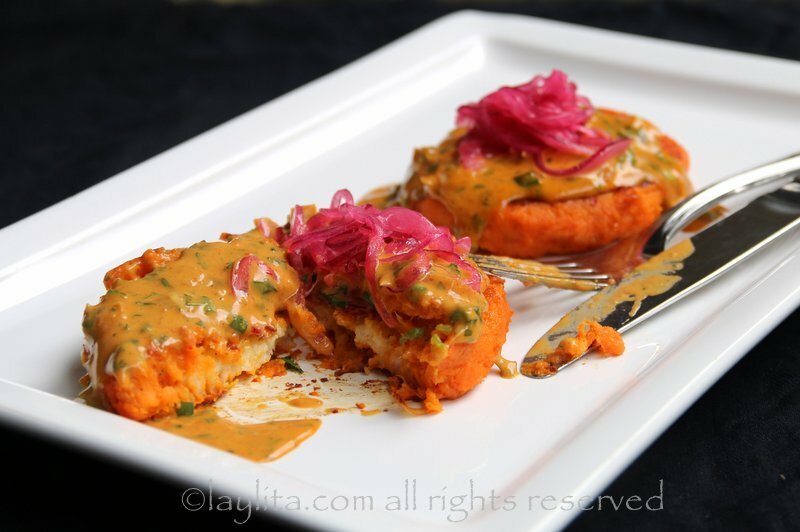 These recipes sound amazing….for a gringa! Can’t wait to try them. 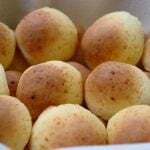 It all started with a search for Pan de Yuca, which I’ve bought for years and finally decided to look for a recipe to make them myself…YEAH! 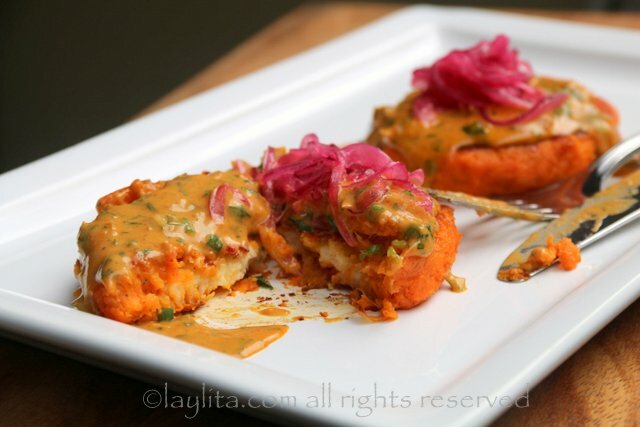 I will be making these this week because they look delicious! 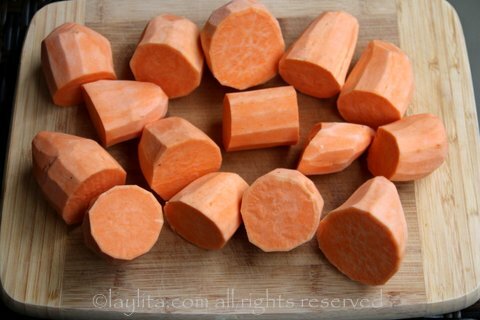 Question though: I bought at a Latin grocery store “camotes” which is usually translated to “yam” in English. I just wanted to check that using yams would be okay. Thanks! Yes, they will work fine. Make ahead, finish off for dinner- nice for a busy life. Not to mention they look absolutely delicious!